Although not typically the subject of high profile news stories these employees (e.g. home health aides) will soon be seeing a significant change in how they are paid. Nationally, the Bureau of Labor Statistics (BLS) suggests that approximately 1.9 million workers across the country would be re-classified by the Department of Labor (DOL) under the Fair Labor Standards Act (FLSA) and this could mean big changes for the fifteen-thousand or so home health aides employed in the immediate area. According to the DOL, beginning in 2015 these so called “direct care” workers will be subject to minimum wage laws and qualify for overtime pay for their services. Up until the 2013 ruling by the DOL, a home health aide or other “direct care” worker would have fallen under a provision of the FLSA that excludes “domestic service” workers from those two specific legal wage protections. Combined with a very strong job outlook (the BLS is projecting 70% job growth from 2010-2020), these new protections could significantly impact wages both nationally and locally. Despite making up approximately 4.2% of the total workforce in the region (compared to 3% nationally), the “home health aide” has seen very little growth in compensation in recent years. In addition, home health aide salaries repeatedly come in at or near the bottom of the list of healthcare support occupations in terms of compensation- again both nationally and locally. 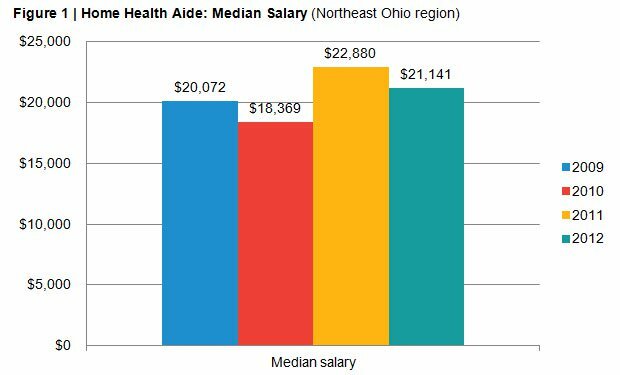 As the figure below illustrates, even high demand and high levels of job growth in Northeast Ohio has barely moved the median salary since 2009.